A Personal Computer combined with ignorant curiosity can be a lethal combination. I should know since I have Personal Knowledge. I really didn't want to buy a PC back in August of 1996 but Melissa (my wife) had been spending longer hours at work doing things that could be done at home if only we had one. Eventually I relented and it was decided we'd take the plunge and spend the money. It was not that I was adverse to the technology. Indeed I had no such qualms since on my job it was a necessary tool; I worked off of a mainframe, and on the PC side used Windows 3.1 (which from the present perspective can be seen as more of a crutch than advantage). But for home use I had trouble justifying the economics. That is until the argument of being home longer finally sank in; I could relate to that. So one bright shiny Sunday morning the Best Buy brochure lured me to make the purchase. Of course the PC advertised in this manner wasn't available but one approximating our budget was ultimately procured for the lavish price, by today's standards, of $2300, which included a Packard Bell (PB) computer with 15 inch monitor and ink jet printer. It was a Multimedia E140. It had the soon to be outdated (read: as soon as I left the store) Pentium 150 MHz processor with the early Triton motherboard. I would realize later that the PC actually was a great starter set allowing me to upgrade (read: spending lots more money) all kinds of things to keep relatively current technologically speaking. The motherboard was the one thing that would bring me to a screeching halt before I was willing or ready, it's not USB ready so there is a 1999 dead end. However the machine allowed me entrance into a whole new world of learning. Read: the more I broke it, the more I learned. One pre-1996 Christmas evening I was playing a demo game called Hexen (which should have been my first clue to the trouble brewing) when I got a call from my brother Bill. While conversing on the phone I continued with the game until the machine froze up. Still talking to Bill I powered down and then rebooted the machine. But it would not come back up. No reboot, no finding the C: drive. I had owned the machine only a few months by then and had no clue to the cause of this behavior. After Bill and I concluded our conversation I called the PB help desk. Without boring you with the details, the ultimate solution in their eyes was to reformat the hard drive. This meant losing all the data I had collected in the form of files and personal information. It still would be a while after this event to learn the number one rule in computer management: maintain a current back up! So of course the reformat and reinstallation to the factory setting was successful. This seems the first line of solutions to those PB techs. Why keep someone on the phone longer than necessary by really finding the root cause when such a simple and elegant fix is available? This would not be the first time I would run this gamut with them. But what the simple-minded tech should have tried was to reboot with a Windows Recovery Disk, which I had on hand, and re-copy the system files from it to the C: drive. Extremely basic!! What I had done in my ignorance was to remove those files while "house cleaning." This outrageously simple solution would have saved all my data files and had me back on line in minutes if not seconds! Thus was I introduced to the world of the "technical help desk" and began my own technical education. Since I had now had opened the computer's case I could poke my nose and fingers in there at will. And wily-nily I did. I soon became more enamored with putzing around inside the machine than outside. This is the real definition of geek: loving computers for the sake of playing with them and reconfiguring them than for their real-world application. Eventually I would look for reasons to open the case and poke around. This led to the inevitable upgrades of new hardware like adding a Level 2 cache, adding more memory, adding a newer processor (AMD 300MHz overclocked to 333), new BIOS, new graphics card, sound card, modem, Zip drive, still another modem, a new additional hard drive, hard drive controller card, and finally a network interface card for our brand new cable modem, and the software education that accompanied these new gizmos. This was fun stuff! Now I always keep in the back of my mind the possibilities for getting back in there and mucking about within only the constraints of budget. I learned a lot along the way though with plenty of tales of horror and panic that inevitably comes with the disease of "upgrade madness." And now I will conclude this tale by the recounting the most recent disaster. 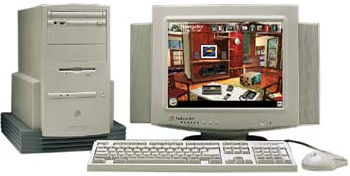 By the end of July of 1998, shortly after its release, I broke down and bought the Microsoft Windows 98 upgrade and did a clean install of my system. It had seen a few crashes in the previous couple of weeks and had become overcrowded with program installations and uninstalls and a myriad other changes, and I needed to clean the whole thing out and get back to a pure and simple Registry. So July 30 I bought a copy at a local Wal-Mart at list price. What the heck. And I would spend Friday reformatting the hard drive and doing the long familiar clean installation, wipe out the hard drive and reinstall everything. This was my way of resting after the busy previous day of changing the oil and oil filter in the Cavalier, changing the air filter, rotating the tires, lubricating the ball joints, cleaning out the garage, making that area presentable again; all on a 97° day with equally high humidity. Still feeling bruised by the recent news of not getting the two jobs for which I had just interviewed and had such high hopes (I was still looking for work after moving to Savannah the previous March), I thought would take the next day off by playing thus with the computer! I was working on a machine that had seen its share of crashes in the previous two years under good ol' Windows 95. I heard that Windows 98 was supposed to be a more stable operating system and I was tired of reformatting the hard drive and starting over every few months. Such "fun" had worn off, and I hoped this would be the last time. I finally started at 11:48 am, Friday morning, July 31st, when, at the DOS prompt (not the Window DOS Prompt) I typed "format C:" and away the adventure began. At 11:58 am the machine completed the check of the existing disk format. Verification of the disk capacity ended so I rebooted with a start-up disk I made having adding my CD-ROM's drivers to insure that I would be able to access the drive to acquire the Windows 98 disk. I then typed "d:\Win98\setup.exe" and we continued. By 12:03 pm, the next step was an Upgrade Compliance Check, and since I wiped the HD clean and it couldn't find a former product to upgrade. But it allowed me to put in my Win95 CD, and with a "browse" function it located the Setup.exe file, permitting the continuation of the install. It just wanted to verify that a Win95 setup.exe file could be located to confirm a legitimate upgrade and that I wasn't pirating the product; then it told me to put back in the Win98 disk and I could continue. I then created a new Startup Disk (a recovery disk) under Windows 98, and I'm glad I did as it came in handy later when I nearly lost the entire HD and was afraid I would be required to extract it from the case to bring to a technician to recover its use! I'll describe that momentarily. So by 12:17 pm the copying of files started which would be used to begin the new operating system installation. It didn't take too long to complete the next steps of setting up new hardware, initializing a new driver database, setting up Plug 'n Play devices, and then continuing to set up the hardware and updating the system settings. In spite of the fact that I wanted to use my own new CD-ROMs to install the drivers for the sound card (Ensoniq AudioPCI) and the video card (ATI Xpert 98), Windows 98 used its own driver files to do that without giving me the option. I would later make the corrections. At 12:40 pm the Windows Password screen was presented and in short order it installed the printer drivers, looked for a monitor .inf file, then revealed the Welcome to Windows 98 screen. Now I could start reconfiguring and reinstalling all my applications. I was virtually done. So the whole thing went off very well without any of the hitches one fears with such a complicated piece of software technology. And by 1:14 pm I was finished installing the internet connection, the modem setup, and my own audio and video drivers. At this point I ran ScanDisk and found that I had 1.376 GB of disk space available (on a 1.6GB HDD), finding I reclaimed a good chunk of disk space. And I hadn't even converted to FAT32 yet, which was the new File Allocation Table known for offering a more efficient use of one's hard drive space. That was next, and at 1:36 pm I was greeted with the "Success" flag, and I was home free. After running the FAT32 conversion I had available 1.433 GB of disk space. It all took an hour and three-quarters. Not bad, and even kind of fun. So I was quite pleased with the whole matter. And I continued installing things like WinZip and the Zip drive. During one installation, I don't even remember which it was, something happened that would cause some General Protection Faults (GPFs) to occur. I also would try to access some files on the Win98 CD (the TweakUI files) and got the Blue Screen of Death stating the disk couldn't be read and maybe it wasn't there or that it was dirty, and if you wouldn't mind very much would you please re-insert it and hit Enter or Escape? This behavior would not occur on accessing any of the other files on the Win98 CD-ROM, so I thought I'd just call Microsoft on Monday and get a replacement disk. However I soon learned that things were not going to sit well with this current installation. It became so unstable that by the evening I had determined to redo the whole thing--either by just reinstalling Windows or again reformatting the HD. I overrode some of the media files (audio) with the Win95 version of them that I really liked better, and had kept on a Zip disk. And when I wanted to change back to the new ones I could not get Win98 to reinstall them. With these minor quibbles and considering the GPFs it was obvious to me that I couldn't live with the way the post-installation routine went, even though they were not critical issues. By late in the evening that same day I decided to go ahead and reformat and reinstall once more and start from a clean disk, feeling that if I only reinstalled Windows I might be leaving behind some "crumbs" to degrade future performance and stability. And so that's what I did. It was now around 10 o'clock in the evening and I was feeling I could get this done within a couple hours. I got to the DOS prompt, hit format C:, and then, by habit, put my Win95 startup disk containing my CD-ROM driver in the A: drive and rebooted. But now I couldn't get to the CD-ROM drive as I could before and the uncertainty began. I quickly realized my error of putting in the Win95 version of the Startup Disk, and replaced it with the Win98 disk. But that didn't seem to help. I could get to the D: prompt trying to access my CD-ROM but when I typed DIR to view the contents of the drive there was no sign of a Win98 folder to be found! It wouldn't recognize a C: request since that drive had been wiped clean. The sweat and cold chills started to break out and I started feeling a little clammy. I hate when this happens! I really don't know my way around DOS to go very far at all and thus I now felt I was in way over my head. I could only envision myself needing to remove the HD and take it to a local shop where they'd charge me handsomely to recover the data, reformat the drive, and install a boot sector on it. I just couldn't figure out what the heck those files were that I saw listed under the directory of D:! It should have been my CD-ROM I thought. What appeared under the Directory command looked like a listing of some type of boot disk, but I knew it wasn't the A: drive. I tried viewing a couple of files on it thinking that the Win98 folder might be buried in there somewhere, but no luck. There was a Help file listed so I typed that in and up came a file which I was certain would be of no use to a novice like me. There was a lot of information about file attributes and switches to use in DOS commands but it meant nothing to me. However, towards the bottom of the file was some piece of information about the occurrence that when one is in the midst of formatting, an occasion can result in the CD-ROM drive being bumped to a higher letter when RAMDRIVE takes over the D: letter. I wondered, could that be it? If I type "E:\Win98\Setup.exe" would it work? Indeed that was the case! So I used E: in place of D and I was back in business. I had almost watched my life flash before my eyes during what had seemed an hour of fear and terror. Should I call my older brother Jim who'd know what to do? Should I spend the minimum $35 calling Microsoft's Tech Support? Should I just shoot myself now and get it over with? But in what really must have been less than 5 minutes, Windows 98 was back in the process of installation. I was very glad I made that copy of the Windows 98 startup disk, as the Win95 version won't work when the drive has been converted to a different file system (FAT32). It took a while to figure out that I simply used the wrong Start-up disk before I woke up to the error. Now if, like many people, I had waited until after I was all set with the new installation before making it I would not have had a prayer. But the setup program didn't give me the option of waiting; I could make it now or cancel the setup (at least that's what I thought "Cancel" meant). Everything else went smoothly after that, including the entire driver installs and applications. So now I have a system I don't really need to tweak much since I've completed getting the Desktop where I want it. This setup has now gone two years without one reinstallation of the operating system. A new world's record! (For me, anyway!) And now I see that a nice Micron PIII 900 MHz system is priced even lower in the Computer Shopper Magazine than it was a month ago! Should I buy one? Soon, I hope, soon! And that was the last upgrade horror I have encountered. I must be doing something wrong!